Getting into the Spirit: The right garb enhances your experience! Today, costumes encompass more than the Halloween tradition of trick-or-treating. Indeed, increasing numbers of adults are rediscovering the joy that comes from dressing in period costumes. Thanks to the influence of Renaissance Faires and the Society for Creative Anachronism (SCA), adults are embracing costumes and accessories that hearken back to the late Middle Ages and the Renaissance of the 14th through the 17th centuries. During the Renaissance (which literally means "rebirth"), shifting perspectives in philosophy, art, literature, science, and religion had a tremendous impact in Europe, the effects of which are felt to this day. Today's Renaissance Faires capture the essence of that time, with an abundance of music, entertainment, art, and food that celebrate the eras in which they're set. 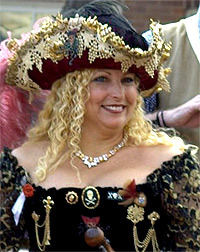 While many Renaissance Faires are set in the England's Elizabethan Era, others find their inspiration in the French Renaissance or in pirate themes of the18th century. Similarly, the Society for Creative Anachronism honors the Middle Ages and Renaissance by researching and creating personas who would have lived during those times. Artisans, combatants, cooks, and others diligently perfect their characters, and gather together - in SCA garb and sometimes with SCA armor - to celebrate with historical accuracy. Whether you're attending a weekend Renaissance Faire or are steeped in the SCA culture, the right costumes enrich and enhance your experience. 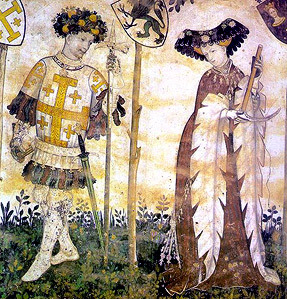 Watching men battle with medieval swords or attending a medieval wedding is simply more meaningful when your appearance blends in with the era. Because it's not always easy to achieve historical accuracy, it's helpful to find a merchant who can reliably guide you to the proper apparel and accessories. Thanks to the Internet, it's never been easier to find sources to help you in your quest. For example, the best online stores will help women find the right undergarments (like chemises, hoopskirts, bloomers, and corsets) to wear under their dresses, skirts, or ball gowns. Men can find everything from vests and doublets to puffy-sleeved shirts and breeches. Pirate costumes, Scottish clothing and kilts, and children's costumes are also available from the right online Renaissance stores. When you're dressing for a particular era, accessories complete your look. For example, Renaissance clothing tends not to have pockets, so a pouch is the perfect accessory to carry your necessities. During the Middle Ages and Renaissance, hats were de rigueur, so you'll need to find the proper cap, beret, snood, veil, or hood. While well-choreographed battles are part of the Renaissance Faire experience, and SCA events are faught with well-trained warriors, weaponry can also be a costume accessory. Accessory weapons don't need to be functional; indeed, they must only fit in with the era you're recreating. Look online to find sources of mini collector weapons, weapon carriers and belts, and accessory swords. Once you begin attending Medieval or Renaissance events, the chances are good that you'll want to expand your wardrobe using techniques from the era. The best online sources offer an array of costume patterns for everything from Tudor and Elizabethan gowns to corsets and tunics. If you want to add this article to your list of favorites or email it to a friend, please use this permanent URL, https://stores.renstore.com/-strse-template/0804B/Page.bok. Permission is granted by the author to quote from this page or use it in handouts as long as you include a link back to Renstore.com.